Sitka Gear designed the Cloudburst Jacket with a single philosophy in mind: Miserable weather should never turn hunting into a miserable experience. They spared no detail in developing a jacket that maximizes comfort and ease of use for dedicated big game hunters. The lightweight, 2-way stretch GORE-TEX® Fabric is Guaranteed to Keep You Dry®. Sitka Gear designed the Cloudburst Jacket with a single philosophy in mind: Miserable weather should never turn hunting into a miserable experience. 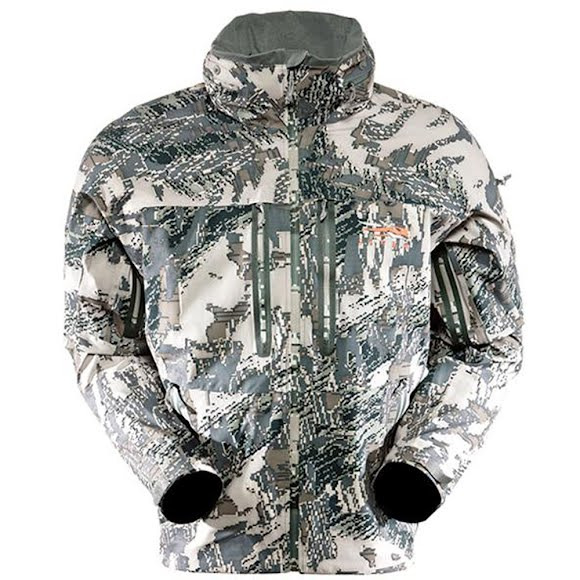 They spared no detail in developing a jacket that maximizes comfort and ease of use for dedicated big game hunters. The lightweight, 2-way stretch GORE-TEX® Fabric is Guaranteed to Keep You Dry®. The face fabric, an abrasion resistant 2-way stretch polyester weave, is durable and allows the jacket to move with you as you push through the torrent. All zippers are welded and watertight, which is significant, since there are a lot of them on the Cloudburst Jacket. The full front zipper makes for easy on and off in rapidly changing conditions. Two zippered hand pockets, two zippered chest pockets, and a zippered upper arm pocket cache everything you need quick access to. Pit zips open to create efficient convective cooling when it&apos;s time to move fast. An articulated, four-panel hood fits snugly around your head and moves with you as you turn, maximizing visibility. And when the action heats up, the hood tucks into a zippered pocket on the collar to keep your ears clear and the noise down. Adjustable cuffs seal out the elements. With it&apos;s full array of functional features, the Cloudburst Jacket remains incredibly light and packable, so you don&apos;t have to second guess whether to bring it along. Optifade camouflage from GORE® is the first and only concealment system ever scientifically designed around the way a hunter&apos;s prey views the world. It&apos;s the only concealment system to combine a symmetry disrupting macro pattern with the fractal geometry based micro pattern designed to become nothing in the eyes of prey at engagement ranges of 20 meters and beyond. To construct a GORE-TEX® laminate (fabric), we bond the GORE-TEX® membrane between high-performance lining and shell textiles.